Light blue, navy blue and royal blue nail designs are in trend these days among pedicure lovers! Blue is the warmest color. Moncy Barbour says:”Let the blue sky meet the blue sea and all is blue for a time”. So what’s better than having light blue, navy blue, and royal blue nail designs? The color blue triggers the release of calming hormones in the brain, making it the best color for relaxation and study. However, all shades of blue are perfect and reflect the personality of calm people. So for you as a calm woman and from now on, you should always use blue for a cute nail design that represents your unique personality. And now since we both are on the same page, let us check the list below of bright blue, navy blue, and royal blue nail designs that are going to blow your minds and blue lovers’ hearts! Jennifer Kostuik says:”Two colors are enough, just blue and white more might be a nightmare”. So combing the zaffre blue color here with the white one in a nautical style is a suitable combination according to color choice. Go stylish with the navy blue by adding to it golden decals and painting other nails with gray, and in the middle finger try to combine the 2 colors separating them with a black border. Blue is the only color that maintains its own character in all its tones…it will always stay blue. 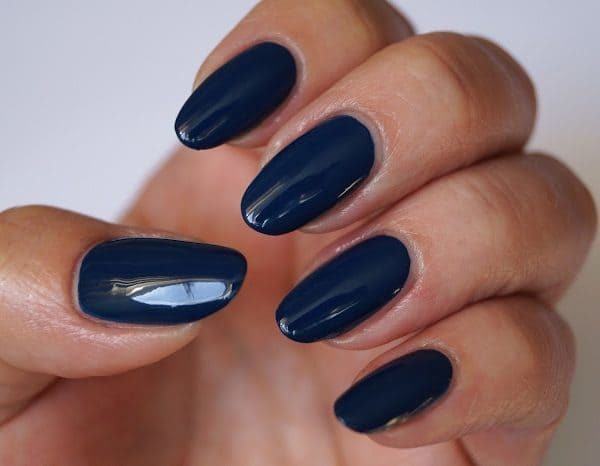 Navy blue is one of the shades of the blue color and it gives a beautiful shape painted on a women’s nails especially when having the ring finger painted with a lace pattern of the navy blue color. Navy blue designs are just simple, but adding golden lines to them and designing the ring and thumb fingers in the opposite way (golden base with navy lines) gives the design a new taste. Ballerina shaped nails are the most trendy ones. But to add beauty to it just wear a zaffre blue manicure on them, covering your ring nail with blue decals. Light blue, navy blue, and royal blue nail designs are all breathtaking! Now according to this design, it looks simple at first but these 2 golden horizontal stripes at the top of each square nail don’t make it simple anymore. This shade of blue is a strong color, but to make it stronger you can add silver decals on your blue nails, and polish your ring nail with glittery silver. Pink and puffy is what most girls like to include in every nail design they wear. And blue nails don’t prevent you from doing that, just have a blue nail design with a ring finger polished with a pattern of ballet slipper pink. Splash your design with blue because the purest and the most thoughtful minds are those which love the blue color the most! In this design go navy blue but have navy waves in your ring finger by blending the white and blue color. Decorate your square nails with blue glittered tips having the ring finger covered with blue glitter. Greet your winter season with this dark colored blue nail design, and decorate it with brighter blue colored snowflakes. Let your nails indicate the weather you’re going through in a funny way in these cute figures stickered on the pinky, middle, and thumb fingers. Light blue is the color of the ocean, and when I see the ocean all my sorrow is washed away! In the design above we can see the light blue color with the silver ring finger giving a powerful design for a woman’s cute hands. This matte Prussian blue with the golden endings in each nail is one of the best designs! It shows elegance, fame, and it can be worn on several occasions. Square tips aren’t one of the simple french tip nail designs, it’s unique and with this blue color shade it gives glamour to a woman’s outfits, especially with this shiny cross made from the silver decals on the ring finger of a blue base. Light blue, navy blue, and royal blue nail designs are the best! 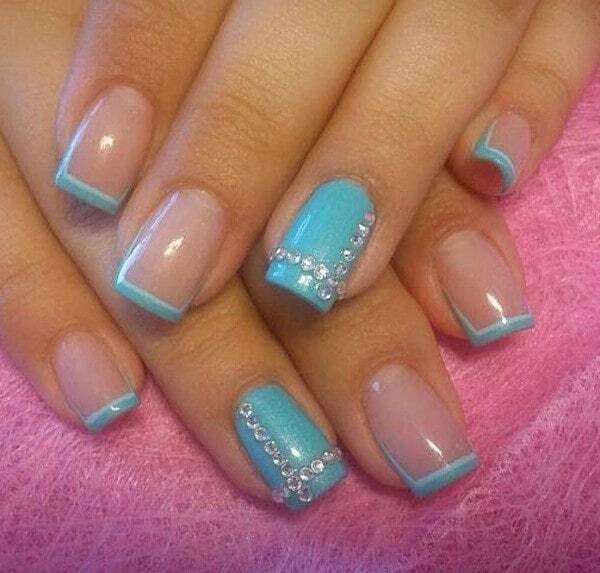 So what about having baby blue tipped nails instead of white cliche ones? I don’t know about you guys, but this design reminds me of “Elsa”, the girl with the blue dress in the”Frozen” movie. The design looks just very suitable for her dress! The dark blue glitters at the edges with the bright blue glittery tips with the white base and the blue flowers, they all remind me of her. Blue symbolizes trust, loyalty, and confidence. 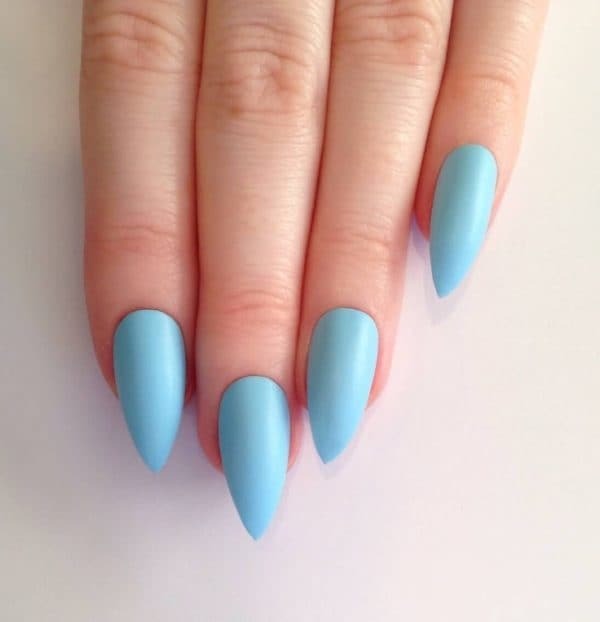 So if you are a confident and a loyal woman, don’t miss the chance of wearing this light blue stiletto nail design! Sky blue is the color that reflects calmness and weirdness at the same time. A calm woman wearing this design with this feather great touch will totally reflect her in a positive way. For a spiritual ombre blue design, you can use bright and light hues to lighten up the mood and fade away into cloud 9. For example, the above nails range from the tiffany blue color to a brighter blue. White polka dots with a blue base are super cute, in addition to the sparkling blue ring finger. Despite the possibility of being perceived as a cold and unfriendly color, blue is the most commonly used color in corporate identity and therefore great for business events and meetings. It reflects an image of confidence and elegance that is not easy to be achieved. Dark blue is the color of mourning in Korea. Maybe that’s because psychologically it’s a nostalgic color that ties the past to everything that happens in the present and in the future. This design works for celebrations and mourning. It is a divine style that you can never worry about over or under dressing with. You women always face the problem of time, you feel you don’t have time between work, house chores, and fashion world. This design is what you need its color is perfect and takes few minutes to be done. There’s definitely a logical reason for the sky’s color to be blue. It has all the shades of blue in the world and at any time and in any season you can’t help but get that relaxing feeling when you gaze at it whether it was dawn, noon or midnight. Every shade is unique and makes you feel better in its own way. Dark blue hues like midnight glitter blue are not only heart mending when you feel down and stare at the sky after you had a fight with your special someone wondering what to do. Marine life is not for everybody obviously. It is only for the strongest and those who are ready for any kind of difficult and unexpected encounters. Go with the nautical marine theme applying swirly stripes and all with a fun and upbeat Brandeis hue to give the effect of the wavy water tides of the sea and think about a cute design for the accent nail like an anchor, sea star, shells etc… to make it more appealing. If you are ever feeling blue, then only a blue nail design can heal you with its complexity! We hope the list of 45 light blue, navy blue, and royal blue nail designs above was the answer to all your prayers and remember to always keep in mind that creativity is the only thing standing between you and your popularity. Be your own true self especially if you are a blue nail lover! Hope you enjoyed!